Rolling in the hills of Chianti hills, Villa Annagloria is a luxurious hot spot for relishing a true Tuscan tour! It sways romantically on the hills of Tavarnelle, very close to Florence, Italy. It is nestled by historically important places of wonder including Volterra, Siena, San Gimignano and other prominent cities, towns and medieval villages. This is also surrounded by an array of lush greenery including olive trees, roses and other unique Mediterranean herbs. History says that this was once an ancient manor house that was owned by Sernigi family belonging to the fifteenth century. Passing on to many hands, right now Villa Annagloria remains under the ownership of Corti Family who with great care restored the whole villa. The architectural style that blends with the outside natural setting of the villa is the cornerstone of this bountiful villa. Ideal location for discovering the woods! 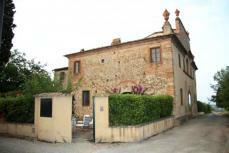 Located in Chianti itself makes the Villa Annagloria a special one. This holiday rental is rightly the spot of historical, eno-gastronomical and environmental center point. You can certainly take long strolls down the road and visit the nearby places that are popularly known for producing excellent wine, go on trekking a sequence of medieval churches, abbeys, hamlets, castles, monasteries, manor houses and villas, nearby. It also proves to be best for strolling in the woods, vineyards, olive trees and woods for discovering a true heart of Tuscany where you can become reconciled with the natural rhythm of life. The whole of this Italian villa has carefully separated rooms that make it your next home! The antique furniture, which remind the bygone Tuscan region flood the villa. There are 6 bedrooms in total, with a capacity of sleeping up to 11 people. On the ground floor are two single beds, offering the garden view, with en suite bathroom, with shower/bath features. There is a separate bedroom for the baby sitter behind the kitchen area. Apart from these is a bedroom with two single beds. On the first floor, there is again a double bedroom with king size bed and wide windows that overlook the garden and the swimming pool. A yet another bedroom that is themed after yellow and green color has two single beds, offering the courtyard view. Both these bedrooms have bathroom with shower features in them. A yet another room is color themed to be in blue and white, and has a queen sized double bed, offering courtyard view. It has an attached bathroom with shower feature. The next is the snow white bedroom, with queen size bed, overlooking the nearby church and cypress tree avenue. Following this is a single bedroom, having a single bed in it. Additionally, if you may need an extra bed, get that on asking. This bedroom has a bathroom attached with the view of the garden and the front of the villa. Apart from these, this holiday house has a large sitting room, housed with a hundred year old fireplace, fully supplied kitchen that has a very big service area including of a pantry, laundry and a storeroom. Satellite TV and stereo system are mounted in the villa’s insides to offer a theatrical effect. The air conditioning service, built-in screens in the windows, furniture in the garden area, huge stone terrace, outdoor eating area, lawns, rose gardens, olive trees, armchairs, a table on the side, swimming pool encircled with stone deck are its few other drawing cards. Wonder and amazement is Villa Annagloria! The painstaking restoration has resulted in creating a noble family home in the form of Villa Annagloria. This is certainly the best place to unveil the true Tuscan splendor! You can also give in to the pleasure of trekking, mountain biking, wine tasting, involve in tennis sport, and horse riding. Remember, Chianti is rightly the best place for experiencing the local food, arts, classico wines, smells and flavors, and Villa Annagloria is rightly takes you to all these places in a single shot. Start your planning now!